As a service it's the people in our practice that is our greatest asset. Highly skilled professionals collectively working together to ensure the best results possible for our clients. Our team has a history of ground breaking procedures along with fresh new talent, but most of all you have come to the place where people care. If that doesn't give you reassurance... over 50 years as a veterinary clinic should. Bill studied at Massey University from 1975 – 1979 graduating with Distinction in 1980, gaining several awards including the National Dairy Prize in Veterinary Surgery, the Upjohn Prize in Clinical Pharmacology, and New Zealand Freezing Companies Association Prize in Veterinary Public Health and Meat Hygiene. From graduation Bill joined the practice which was then Thompson Marks and Christopher at the end of 1979. Bill also advanced in the industry proving himself within the practice in a few short years. It was testament to his work ethic, ability not only as a veterinarian but a businessman when he was asked to cement his position and career as a partner in 1986. Bill is a well respected equine veterinarian who prides himself in keeping up to date with current equine veterinary procedures, especially in the racing and reproductive areas, and he was one of the physicians to help initiate and introduce ultrasound to equine reproduction. Bill has gained overseas experience, spending time in Kentucky (USA), and Newmarket (UK) in 1998. Outside of the practice Bill's devotion to the broader industry saw him as a committee member of NZEVA for three terms, and also on the committee for the Waikato Branch of the NZTBA for 12 years, and is currently still a long standing member of the Matamata Racing Club Board. Outside the practice Bill is also passionate towards most things horses, being a breeder and owner of thoroughbreds and sport horses on his own property, a keen racing man often tuned into Trackside. Bill is a family man and like most Kiwi's enjoys many other sports including fishing, golf, cricket and rugby. Situated in the depths of the Waikato he has plenty in common with his clients being a racing and an All Black fan, but it's not so easy when you hail from Auckland and are a die hard Blue's supporter, a clear indication of what he has sacrificed for his career. Emma joined the team at Marks+Ewen in 2008 after returning back home from working in management for Celebrity Cruise Lines in the United States and Europe. Growing up immersed in a family with a strong knowledge and background in everything to do with the equine industry, combined with her acquired business management abilities saw Emma as a natural fit for the role of Practice Manager, where she takes the reins of the day-to-day operations of the Clinic. Emma's diversity allows her to not only to manage the office staff with efficiency, but also to spend time out in the field with the veterinarian team. Being a natural people's person her HR skill-set sees her working closely with staff and clients across resources and business development. Outside the practice Emma enjoys the leisure of the industry where in her earlier years she rode until her overseas career path halted this, now she is involved in part ownership of race horses keeping an eye on not only the racing meets but also equestrian results. Emma is also on the committee of the Matamata racing club where she can be often seen in the winners circle on race days. A Mother of her two beloved boys she cherishes spending time with her family and friends. Being a very enthusiastic super supporter of the All Blacks she also enjoys the cricket, and that's not due to her husband being a Jamaican, but due to this when New Zealand plays the West Indies the family always celebrates a win. Tracey joined us from Ireland where she studied at the University College of Dublin. After graduating in 2007 Tracey's equine interest lead her to complete an internship in both surgery and fellowship in equine internal medicine at Hagyard, Davis and McGee - a large renown specialised equine institute in Lexington, Kentucky. From the U.S.A Tracey continued her quest for a specialised career path to Matatmata, another equine hub were she joined Marks+Ewen in 2009. Although Tracey enjoys all aspects of equine medicine, she mainly dedicated her time to stud work, where she reaps the achievements of watching horses she has helped bred and treat go onto success on the track. Her main interest and focus is during the breeding season where she commits her time running the neonatal intensive care unit and medical cases at the clinic. Tracey also is involved in sales work and can be seen at the annual Karaka yearling sales. Tracey also has equine involvement outside of the practice where she rode in dressage events, competing for several years in Ireland before her studies and career intervened. Following a Marks+Ewen tradition she has acquired shares in thoroughbreds, following the races with a keen eye as she waits for one to be the 'next champion'. Like many of the Irish Tracey enjoys watching the national rugby team, where her loyalty finally paid off with a convincing win over the All Blacks cementing their place in history, breaking what seemed to be an everlasting drought, the only thing dry that night were the pubs. Tracey also enjoys tramping the beautiful New Zealand landscape, tennis, a good book and a glass of wine, sometimes the latter more than the others. Jessica graduated from Massey University in 2011 with a Bachelor of Veterinary Science. She has since held a variety of jobs in the equine industry including with top New Zealand horseman and ex world champion - Vaughn Jefferis show jumping yard in Cambridge and another stint at Windsor Park Stud as junior vet. As Jessica sought to progress and further her career she arrived at Marks+Ewen in 2014 where she completed her internship and is now a veterinarian associate. Having a devoted equine passion inside and outside of the clinic, it's only natural that Jessica enjoys all aspects across equine medicine - nurturing horses comes as second nature. Her personal involvement in the athletic side sees a growing interest in sport medicine. During the core season Jessica has majority of her time dedicated to stud work. With a genuine love for everything horses Jessica's interests outside of work involves spending a lot of time with her own horse's, this including show jumping and hunting as well as the breeding of show jumpers and race horses. It's fair to say that when Jessica isn't working with or riding horses she is thinking about horses, and we think when she goes to sleep she also dreams about them. Holly is from England where she studied at the University of Nottingham. After recently graduating in 2015 she journeyed straight to New Zealand, here she plans to lay the foundations for her future career in equine medicine. Holly joined us here as Marks+Ewen in 2015 as one of our interns, with that under her belt she is now proudly one of our associates. Holly’s interest in horses was inherited from her racing involvement from a young age. Growing up on Epsom Downs in Surrey, she regularly went out to watch the horses train and frequently accompanied her father to race meets. Going on to work in sport horse and racing yards with a dispassion of an office job, it is evident that the logical choice for Holly was always heading down a path of an equine veterinarian. Holly can be seen at the local track each morning attending to everyone’s treatment needs and then is responsible for running our hospital. Her particular interests of field are internal medicine - neonatal medicine, anaesthesia, radiography and is fascinated in lameness. Outside of work Holly continues her fathers tradition with a share in a 2yo racing filly. She enjoys shooting (mostly clays! ), a spot of tennis and is a tenacious leisure skier, and loves cooking and entertaining. Keen to embrace all aspects of life in New Zealand she has grown in love with our white sand beaches, as a result she plans to take up surfing. Although she has grown fond of New Zealand life she will still be sporting the English Rose on her rugby shirt come game day! Sarita grew up Norfolk Island and eventually moved to Matamata from Palmerston North where she studied at Massey University. Graduating in 2007 and after working at various racing facilities around the North Island she arrived at Marks+Ewen in 2008 as a Veterinary Nurse. Sarita’s passion for horses means the clinic was a natural environment for her to be immersed in, this love giving her an instinctive characteristic towards equine care and health. Her time is spent between being in the hospital and out in the field with the veterinarians and has interest in neonatal care, lameness and x-raying. When Sarita is not spending time with client horses she is spending time with her very own. Competing in dressage across the country, Sarita also breeds her own sport horses where she can be often be seen competing on them at the annual Horse of the Year. Born and raised in Matamata Kim studied at the Waikato Institute of technology. Gaining a certificate in vet nursing she has then returned to her hometown as a natural choice, joining us in early 2016 as a veterinary nurse. Coming from an agriculture background Kim has held various jobs in the farming industry as well as assisting racehorse training and preparation of yearlings for the sales. Having a self confessed horse obsession it's fair to say Kim lives and breathes everything horses, this has given her a natural ability to care which has been engraved into her mindset, some call this a job Kim calls it a passion. Interested in all aspects of the industry, she is a keen learner with an ambition to always broaden her knowledge. Outside of the business her involvement with horses doesn't stop there, Kim is an avid show jumper where she competes on her own horse. She also is involved with breeding and training thoroughbred racehorses, having success in her first year winning with Gumboots at Waipa. With the small amount of time she allows outside of horses she spends with her friends and family. Michelle was born and raised in Matamata, where like many locals, has a strong background in racing. Her early years saw her working locally in the industry at Richardson Racing and Wexford Stables. She then travelled down to the South Island working for thoroughbred trainers in the Canterbury region for 2 years. Like many kiwis she also crossed the ditch to Sydney where she did a stint for Anthony Cummings. Michelle has been with Marks+Ewen since 2005 where she is now our account manager. One of our long serving staff members Michelle has obtained a great deal of valuable knowledge of the practice, together with Emma she heads our accounts team in the running of the business administration. Michelle is also our very own in-house photographer, working with our external advertising team she is responsible for a lot of our great imagery that you can see across our site and marketing, (the only profile photo she didn't take was her own, but she assisted on which button to push). Michelle's photography also extends to our clients where she captures race meets, eventing, show jumping, yearling profiles plus much more. When not at the practice it’s safe to say she loves going to the races and she obtains shares in a number of thoroughbreds. A highlight was taking Platonic to Melbourne with Richardson Racing to watch it come in first. Michelle continues to pursue photography, this keeps her busy in between watching the rugby, the gym, social events, fishing, and travelling to the U.K where she frequently visits her family. 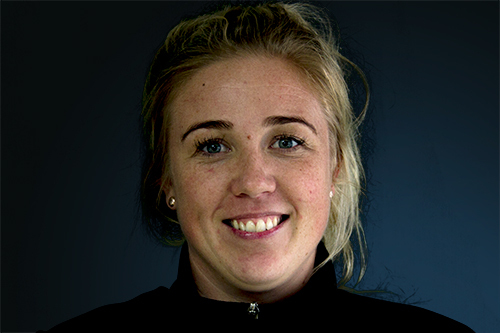 Louise was born and raised in Auckland but moved to Matamata in 2013. Studying at the University of Waikato gaining a bachelor of sport and leisure studies in 2012, she then worked for Jenna Mahoney as a race horse trainer/stable hand, from here she moved on to work for Profile Foods as a bulk food manager. Louise arrived here at Marks+Ewen in late 2015 joining our administration team as our receptionist. Having a passion for horses from a young age Louise is our face of the front office, answering the phones, meeting, greeting and serving our clients as they come into the clinic, whilst organising the day book tracking where and when the veterinarians get assigned to. With an interest going beyond the clinic doors Louise owns her own thoroughbred she purchased off the track as a 5 year old. Outside of horses she enjoys the outdoors, beaches, animals, travel and socialising with friends.